Islamic hostility for Christmas was on full display as documented here: on Christmas Day, Muslims in Bethlehem set a Christmas tree on fire and greeted the Latin Patriarch of Jerusalem with a hail of stones; Muslim “refugees” set fire to a public Christmas tree in Belgium; Muslim jihadis attacked churches during Christmas mass killing at least 16 in Nigeria; Muslim jihadis in the Philippines slaughtered 10 Christians on Christmas Eve to “make a statement”; three Muslim countries—Somalia, Tajikistan, and Brunei—formally banned any Christmas celebrations; due to assassination attempts on pastors and death threats to Christians, churches skipped Christmas mass in Bangladesh and were on “high alert” in Indonesia, with 150,000 security personnel patrolling; in Iran, Christians celebrating Christmas in homes were arrested. Muslims slaughtered two Christian leaders with swords in two separate incidents in Uganda. Patrick Ojangole, a 43-year-old Christian father of five who also supported several children whose families had disowned them for leaving Islam, was hacked to death. According to the slain man’s friend, who survived to tell the tale, they were traveling to their village when they saw Muslim women covered in burqas sitting on the road: “Because it was late in the evening, we thought they needed some help from us, so we stopped, and while we were still talking with them, a man arrived [followed by two more men] … The two women immediately pulled out swords from their burqas and gave them to the men.” One of the three Muslim men reproached Patrick for refusing to cease his Christian activities. Then the Muslims fell on him with their swords. “Patrick was a very committed Christian and a hard-working farmer,” said his friend. “From his farm work, he used to support 10 children from Muslim families who had been ostracized by their families,” as well as his own five children ranging in age from 7 to 16. Separately, a pastor was also hacked to death and beheaded after he and other church members resisted efforts by local Muslims to seize land belonging to the church. When pastor Bongo Martin, 32, confronted and resisted them, the imam of the Muslim group answered, “We have told you many times that we do not want the church to be located near our mosque. Your church has been taking our members to your church.” Then a Muslim named Abdulhakha Mugen pulled out a sword and struck at the pastor’s neck. He instantly collapsed while the Muslim swordsman kept hacking at him and eventually decapitating him. Pastor Martin’s body was later found floating the river. An additional five underground Christians in a predominantly Muslim village in Uganda, including a pregnant mother, died from poisoning after a Bible study. Egypt: A church under construction in Swada village, Minya, was attacked on December 10 by a mob consisting of at least 400 Muslims incited by local officials. “They destroyed the marble, ceramics, cement, wood and church’s signs inside the buildings and destroyed the contents of the building, and attacked and injured some of the workers,” said a local. After the attack, and although the church had obtained the necessary permits required for construction, it the same officials who incited the attack cited the attack as reason to outlaw the church. The population of Swada is about 35% Christian, or 3,000 people, and there isn’t a single Coptic Orthodox church to serve them. Separately, an ancient Christian monastery, the Paromeos Monastery, was threatened by jihadis online. Dedicated to the Virgin Mary it was built over 1,600 years ago—more than two centuries before Islam overran Christian Egypt. Although the ancient monastery receives police protection, Christian activists are calling for greater security measures in response to growing threats. Turkey: Groups believed to be associated with ISIS issued death threats to at least 20 evangelical churches via social media, email, and mobile texts. They included “upsetting videos and pictures” said a human rights activist. Suspected Islamic State militants reportedly said they “are tired of waiting” for Muslims who had converted to Christianity to return to Islam. 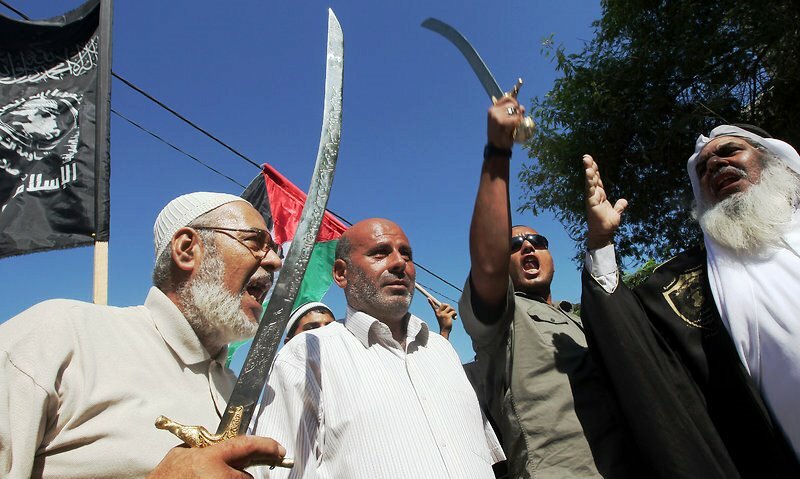 “Koranic commandments… urge us to slay the apostate like you,” said one message. Bangladesh: “He who preaches Christianity must leave the country or die”—such were the words of an anonymous letter sent to ten leaders of Protestant Christian churches. An additional four church leaders narrowly escaped attempts on their lives causing the nation’s churches to cancel Christmas Day church services. Cameroon: Boko Haram jihadis invaded a Christian village and torched a church as well as several homes. Up to 1,000 Christians – men, women and children – were adversely affected, eight killed, during the invasion. After reducing the villagers’ possessions to ashes, the jihadis also set their food supplies and other forms of sustenance on fire, leaving them struggling to survive. Central African Republic: Armed Muslim Seleka militants attacked a camp for internally displaced people killing eight Christians and wounding one UN peacekeeper. Thousands of people have been killed since Muslim Seleka seized power of the Christian-majority country in 2013. After months of massacres, rapes, and looting by armed Seleka, militant anti-balaka groups emerged. Although they see themselves a Christian militia, the nation’s churches condemn their violent actions. Egypt: A 70-year-old Christian woman was found stabbed to death in her house in the Muslim majority nation. She had 10 stab wounds in her chest. Police were informed and the matter was last reported as being under investigation. Eritrea: After finding a new life in Europe, Gospel singer Helen Berhane shared her experiences in Eritrea, including how she was locked in a shipping container and tortured for being Christian. Speaking at a conference in Rome she said: “The only reason they [Muslim authorities] let you go is when they torture you to death…. They don’t want you to die in prison, it’s not their responsibility, so they send you home to die.” Berhane, who was arrested for evangelizing and releasing religious music, was released only after she became deathly ill.
Nigeria: Mercy, a 22-year-old Christian woman who was abducted by Boko Haram in June 2014 and rescued after five weeks, described her ordeal in the Islamic camp. In June 2014, members of Boko Haram overran the town and declared it an Islamic caliphate. At least 100 people were killed in the attack. She was sized from her home in the middle of the night. “Everyone in the town ran to save themselves. My dad and I were separated. I don’t know what happened to him. I think he died the same way many others died, because they refused to deny Christ.” She was marched off to a Boko Haram camp. “When we got to the place, there were about 50 other women. I recognised many other Christians, who had now become Muslims and were forced to undergo Islamic teaching…. My first day was like hell. I cried all day and all night. I prayed like never before and asked God to give me courage.” The next morning, Mercy and the others were taken to a clearing for questioning and asked to convert to Islam. The four other girls were very scared and immediately agreed. I pleaded that they allow me to remain a Christian, but my pleas fell on deaf ears. They beat me and told me to never mention Christianity in the camp again. Then they told me that they would arrange a husband for me….. We were forced to attend prayers at 5am. After that, we were sent to a madrassa [Islamic school]. There was only a short break. After we were given a little food, we returned to the madrassa. They constantly told us to work hard for the advancement of Boko Haram. In the afternoon we were dispersed to do our chores, such as washing the men’s clothes…. I witnessed constantly how Boko Haram members killed innocent people. Christian men who were captured and brought to the camp were killed for refusing to deny their faith. [It was like] the fulfilment of the [things written in the] Bible played out in front of my eyes, as people died for their faith in Christ. But others, including me, could not endure the torture and gave in to their demands.